For majority of 2018, Ethereum was the largest altcoin by market capitalization. This can be due to a number of factors. One of the leading factors may be the ecosystem and digital economy which has developed around Ethereum. Large numbers of Ethereum-based tokens have been launched with a host of different functions and leveraging Ethereum’s blockchain technology in different ways. Decentralized applications (DApps) have also been built on top of Ethereum further expanding the ecosystem. Securing Ether, the cryptocurrency native to the Ethereum blockchain, is one of the most important considerations when users delve into the Ethereum ecosystem. Different wallets enable users to interact with the Ethereum ecosystem in different ways. Some focus on enabling the user to interact with DApps while others have wide support for different Ethereum-based tokens. Security is another extremely important factor to take into account. How the private key is stored and the encryption applied are key security considerations. We present the top Ethereum wallets that provide high standard features across the range of factors important to the Ethereum ecosystem. Security is the most important factor when it comes to choosing a wallet to store your Ethereum. Hardware wallets provide the best standard of security for the everyday user. Hardware wallets apply a high level of encryption that provides strong protection to funds stored. The private key for the wallet is stored on the device itself so the funds are secure even if the wallet is used on a compromised device. Hardware wallets leverage the benefits of both cold storage and hot storage. Funds are stored offline in the wallet when it is disconnected. Users can connect the device to a computer to check the balance and send transactions. Ledger is one of the leading providers of hardware wallets. The Ledger Nano S supports over 700 cryptocurrencies including many Ethereum-based tokens. The main competitors of Ledger Nano S are Trezor and KeepKey. Ledger Nano S is priced lower than both of these and supports a wider variety of cryptocurrencies. The wallet comes with a seal so that users know if the wallet is after being tampered with before arrival. Instructions also come with the wallet explaining the set-up process. The recovery process requires close attention as it is necessary to retrieve the wallet if the device is lost or stolen. Users will be provided with a recovery phrase which they can use to recover the funds from the wallet. It is important that this is secured safely as if anyone accesses it, they will be able to access the wallet via another Ledger Nano S device. To send transactions or to check the account balance on Ledger Nano S, the device needs to be connected to a computer. Ledger has a Chrome application which users can use to send transaction and manage their account. Users can monitor the account balances of different cryptocurrencies from this interface and also send transactions. Some mobile wallets support being able to import the Ledger Nano S to create a watch-only wallet. This enables the user to be able to monitor the balance and receive payments through their mobile phone. To learn more about the Ledger Nano S product check out our detailed review. Exodus is a desktop wallet which has support for almost 100 cryptocurrencies many of which are Ethereum-based tokens. The private key is stored on the users hard drive and encrypted providing a high level of security. The wallet is hierarchical deterministic enabling users to generate multiple pairs of public and private keys for the supported assets. The wallet has a well-designed interface enabling users to view their portfolio holdings and value at one glance. Users can view a pie chart which splits their holdings into percentages and shows the value of each. Users can also easily navigate to either send or receive cryptocurrency. A QR code can be generated to receive transactions. One of the main features of the wallet is that exchanging between cryptocurrencies is also supported. Exodus integrates with ShapeShift exchange so that users can easily switch between Ethereum and Ethereum-based tokens. MyEtherWallet is a hugely popular Ethereum wallet which supports both Ethereum and Ethereum-based tokens. Data such as the private key is not stored on servers as is the case with web-based wallets. The data is stored on either the browser or on the user’s computer. Users can easily create new wallets on MEW. It is also possible to import wallets from some other providers and users can import their Ledger Nano S or Trezor with MEW. MEW has a strong emphasis on security. Users are presented with slides explaining how MEW operates when they arrive on the website. The wallet is open-source ensuring that the security has been assessed by the Ethereum development community. MetaMask is another highly popular Ethereum based wallets. It is a browser-based wallet that enables users to interact with DApps built upon the Ethereum blockchain straight from their browser. The wallet is available in both the Chrome browser and the Brave browser. Users are provided with a twelve-word phrase upon creating the wallet. This phrase enables users to recover any accounts the user creates within MetaMask. The wallet is hierarchical deterministic meaning that users can generate numerous public and private key pairs. Users store the private key in their browser but it is encrypted so that the information is not revealed to the servers. The wallet provides the standard functions of a wallet enabling users to send, receive, and store Ethereum and Ethereum-based tokens. The key benefit of MetaMask is enabling users to visit websites built upon the Ethereum blockchain and interact with them. Users can also interact with the DApps on a test network to make sure they understand the DApp before interacting with it on the main network. More advanced users have the option set up MetaMask on their own RPC server which puts the user in full control of their connection to the blockchain. Coinbase has become almost synonymous with cryptocurrency. The Coinbase exchange platform is one of the most popular choices among users but Coinbase also offers other services. One of their products is Coinbase Wallet. 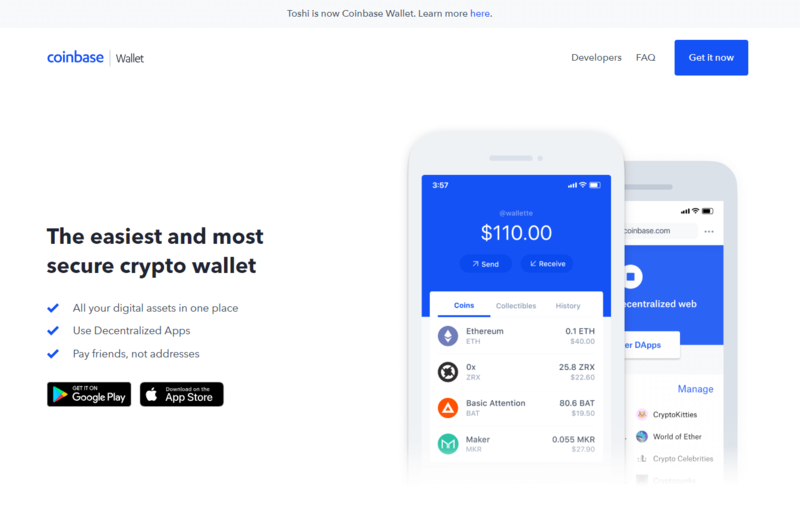 Coinbase Wallet is a mobile wallet which enables users to interact with the Ethereum ecosystem. Users can send, receive, and store Ethereum and Ethereum-based tokens. The wallet also enables users to interact with DApps. The private key for the wallet is stored on the device and is secured via Secure Enclave and biometric authentication technology. The wallet is supported in the web browser, and on both Android and iOS. Using a mobile wallet allows users to more easily incorporate cryptocurrencies into their day-to-day lives. Users can easily spend their Ethereum in stores where the merchant accepts Ethereum as a form of payment. A QR code can also be easily generated so that the user can receive cryptocurrency. The main benefit of Coinbase Wallet is the ability to interact with DApps and use the Ethereum-based tokens. Users can also integrate with decentralized exchanges to exchange between the Ethereum and tokens within their wallet. Guarda is an open-source multi-currency wallet which supports Ethereum along with the majority of Ethereum based tokens. There is support for approximately 500 Ethereum-based tokens including both ERC20 and ERC721 tokens. Guarda is available on OSX, Windows, Linux, Android, and iOS. The wallet can also be used in the web browser. The private key for the wallet is securely stored on the user’s device and encrypted. There is no information stored by Guarda. The wallet is hierarchical deterministic which enables the user to generate multiple public and private key pairs. 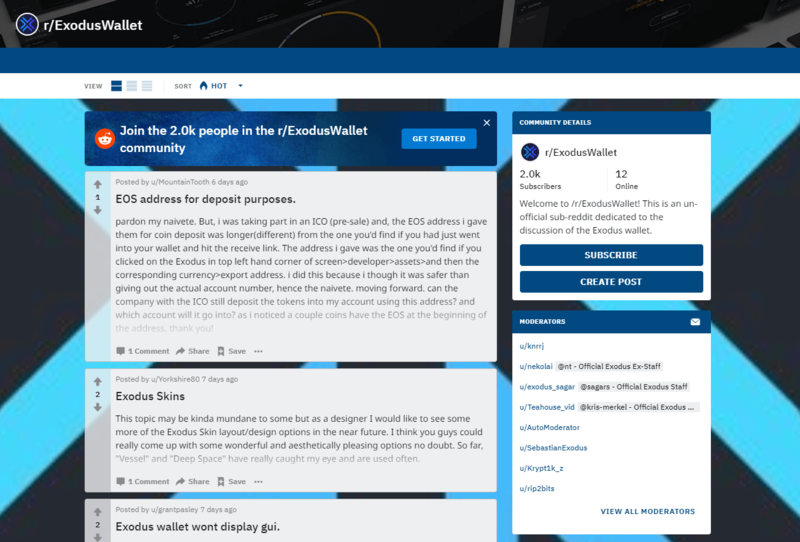 Some of the key features which make Guarda a top-tier wallet for Ethereum are an exchange function and a Chrome extension which enables users to interact with DApps. The exchange function allows the user to securely and anonymously exchange between supported cryptocurrencies including Ethereum and supported Ethereum-based tokens. This enables the user to both speculate on the price of Ethereum in relation to other cryptocurrencies and also to easily exchange it for Ethereum-based tokens. The Chrome extension enables users to use their Ethereum and Ethereum-based tokens in any relevant DApps such as CryptoKitties, Etheremon, and 0xGames. This can also be used to interact with decentralized exchanges such as IDEX. Users can create a new wallet or restore an old one via the Chrome extension. Overall, Guarda is a very strong consideration for an Ethereum through the combination of both its wide support for Ethereum-based tokens, strong security, exchange features, and its extension to interact with DApps. It is commonly shared advice to never leave funds in an exchange based wallet. By leaving funds on an exchange, users lose control of the funds because the exchange manages the private key. In the majority of cases, users also cannot verify whether the exchange actually holds their funds. The exchange has the freedom to hold only a fraction of depositor’s funds and use the rest to make risky investments. Exchange wallets represent the poorest tier of wallet security. Nonetheless, users still commonly leave their funds on exchanges. It enables them to participate in quicker trading and avoid the fees of having to withdraw to the wallet. Kraken implements practices in their exchange wallet which ensures a higher degree of security than most competitors. The majority of funds are kept in cold storage disconnected from the internet. Kraken was the first exchange to conduct a proof-of-reserves audit and also provide a way for users to cryptographically verify that the exchange holds their funds. It is still not ideal to leave funds in an exchange based wallet but Kraken is likely the most secure consideration if users are going to do this.